Adventure and fantasy reign supreme at the National Museum of Bermuda where a playground like no other is now open inside its historic grounds. 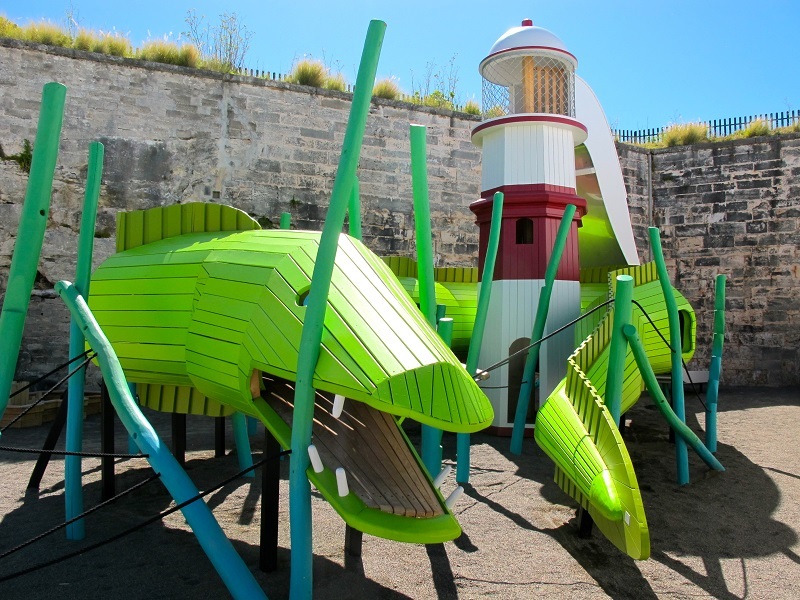 Designed by award winning Danish firm Monstrum, the playground includes a 70-ft vibrant green moray eel wrapped around a 21-ft lighthouse with slide, which resembles St. David’s lighthouse. Other elements include sea grass climbing poles and a discovery sand pit in the shape of the Keep Fort. The playground targets toddlers to pre teens and adults young at heart. 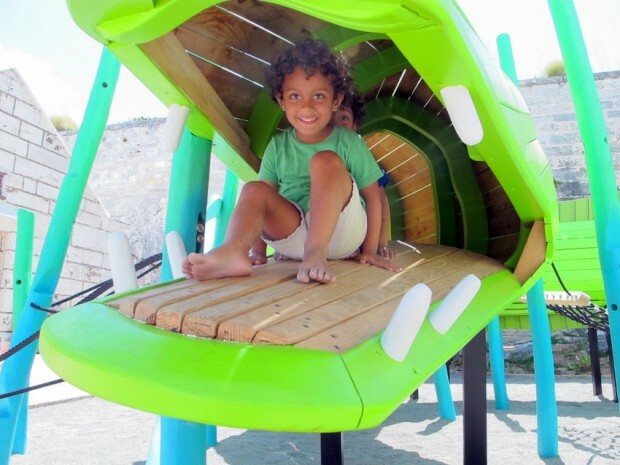 Monstrum is famous for creating unique, colourful, innovative and well-designed playgrounds that are adventurous, safe, and draw upon children’s imaginations. Co-founders Ole B Nielsen and Christian Jensen started in theatre set design and now have over 100 playgrounds to their names, boasting elements such as giant sea creatures, Easter Island heads, shipwrecks, distorted buildings and dragons. The Museum Playground is an art piece in itself, incorporating local natural and cultural heritage. Adjacent to the playground, due to open this fall is the Museum Playhouse, designed by Bermudian artists and designers, Russell DeMoura and James Cooper of Fungus Collective. Working with the Museum, they have created a room of interactive displays grounded in local history and focused on education. “The emphasis is on learning through play as well as encouraging family learning. Much like a Pixar film, the Playhouse will have hidden secrets and adult jokes to make it fun and educational for the entire family,” says Ms. Strong. Both projects would not be possible without the generous sponsorship of ACE Foundation-Bermuda. Lori Samson, Chairperson, ACE Foundation-Bermuda, said: “ACE is delighted to have partnered with the Trustees of the National Museum to support their vision – the Museum Playground which opens today and an educational children’s interactive exhibit scheduled to open in the fall. The Museum Playground is located in the National Museum in the lower grounds by the Dolphin Quest facility in Dockyard. It is open from 9:30am – 5pm, with the last admission at 4pm. Children must be supervised by an adult. The Museum entrance fee is $12 for adults, $10 for seniors and free for children under 16, with a Family Membership available for $75. For more information please contact info@nmb.bm or 234 -1333. I was up there the other day. This thing is incredibly dangerous. Entrance fee gets you access to Museum, Commissioners House, Dolphin Quest, Amazing views, Walkway to Casemates location, and there also happens to be a playground there now. How about fixing the playground that’s outside of Snorkel Park? The swing set doesn’t even work and the ground needs to get more sand. Or if we fix it, will admission be charged as well? @Tough Love – when was the last time you were at this playground? All swings are operational and there is plenty of new sand, additional seating and the water pops fountain has been upgraded. And no there is no CHARGE! Sand and water is FREE!!! So what’s so special about this that I must pay to take my child?? Can I let him roam as I watch from behind a wall??? i dont think people understand the meaning of BROKE,,,NO MONEY AT ALL,,,NUFFIN!at the same time as being in UNREALISTIC DEBT!that we will never pay off…everytime you call on them for upgrades and they swipe that bda credit card it costs you and i, not them and they don’t have to pay it back but we are responsible to pay that bill. Bermudians need to take care of each other now and unite, not fuss n fight coz it’ll be your last plight. You idiots. You don’t have to pay to go on the playground. You have to pay to go into the museum and the playground is a benefit/incentive that you get for doing so. You all have selective reading. And this is under te National Museum of Bermuda. Whoever is in control of the playground outside of Snorkel Park has nothing to do with them! Is it really necessary to call people idiots because they didn’t understand something that you believe you do? @ I’m Amazed……thank you for saying that. Why are people so cruel and bitter; I just don’t get it. Path, your comment makes no real sense. And to call people idiots will not get you anywhere. At the end of the day, people should not have to pay for their children to use a playground. Besides have you even been up there and seen the size of that so called playground? It’s not even worth talking about. If you read clearly, you can see that I am clarifying that you do not in fact have to pay for your kid to use the playground. You pay for their entrance into the playground. So tell me again how it doesn’t make sense?! The children’s playground outside of Snorkel Park is NOT broken. Everything looks wonderful and swings are certainly not broken. I was there yesterday. They will need supervision ,and signs directing responsible use and accepting resonsible usage,etc…We haven’t found mr grange yet I take it,we’re still hopeful of a near miracle ,stranger things have happened here.Here’s the thing “Project lifesaver”, is having it’s 11th annual conference at Rosen Center Hotel in Orlando.It is for those who wander due to autism,down syndrome ,alsheimers,dementia or other cognitive conditions of affliction.It is a service that sells you a pacage of a wristwatch incorperating a locator and a locable strap,a release key and strap ,a portable reciever with (probably) a computer up linc to a gps of the location of an area to be uploaded as an app,an ac power basecharger base.And for boaters there are satalight gps watches can be found at Mayors in Orlando,these are very durable and are waterproof…..I recomend the hotel door movement alarms as a warning system as well,when dey wander dey wander…..
A wonderful addition to the somewhat under stimulating atmosphere up there. Looks like they’re headed in a good direction. However, use caution as you would with any playground or equiptment and supervise your children. Used it this weekend with the family, noted that there are some hazards, I won’t be participating in the fun next time lol, I’ll leave that to the kids.